Marvel has outdone themselves with the newest alternate universe version of Spider-Man, asking a question no comic fans ever would – or should. In bringing the disturbing Spiders-Man to life, they’ve shown that you don’t need to be human to be a hero… you could be a pile of thousands of spiders squished into a spandex bodysuit. All things considered, the origin story of Spider-Man proper, Peter Parker, treads easily into the realm of body horror. And in creating Marvel’s current ‘other’ Spider-Man, Otto Octavius (the “Superior Spider-Man” as his friends call him) Marvel embraced that same genre. 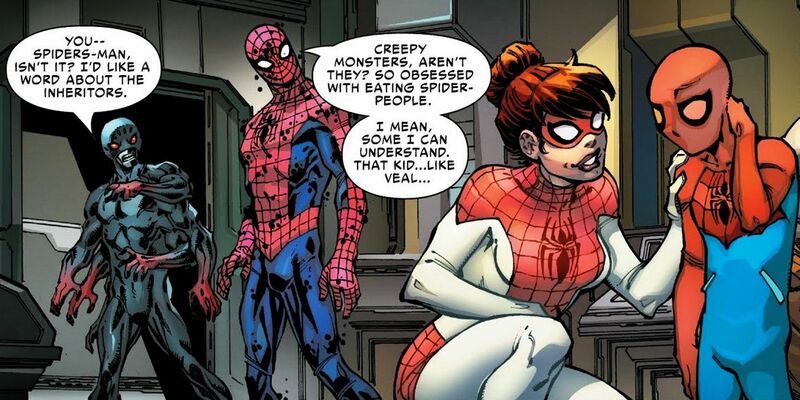 But now, even Otto Octavius and Peter Parker swapping bodies has been topped in Spider-Geddon, thanks to a nightmare many Spidey fans will wish they could un-see. 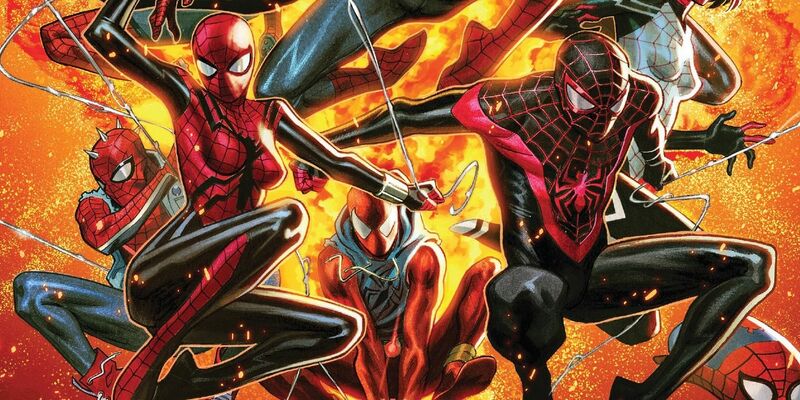 Readers won’t need to know all the details surrounding the nature of the larger Spider-Geddon event that this reveal is tied into, simply that an army of various Spider-Man variations from parallel worlds is being assembled to fight a cosmic threat (as usual). And in Marvel’s Spider-Geddon #3, one of the recruited heroes stands out. 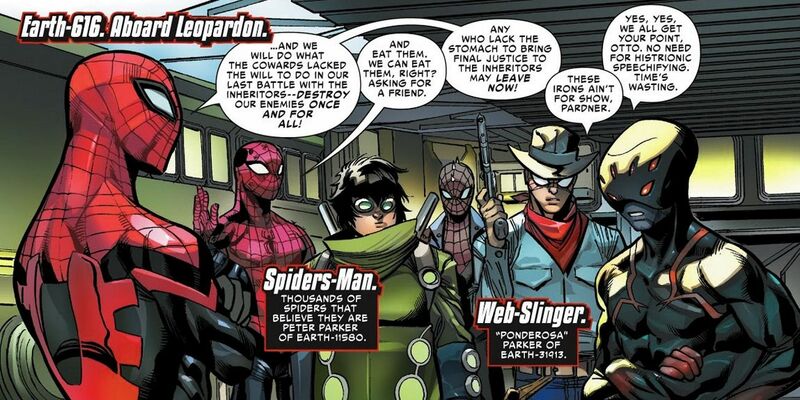 The cowboy Spider-Man may be entertaining, as well as the human-spider hybrid Norman Osborn of Earth-44145. But we’re of course referring to the introduction of “Spiders-Man. Thousands of spiders that believe they are Peter Parker of Earth-11580.” What isn’t clear from that text box is whether this hive-mind-formed version of Spider-Man is an oddity on its homeworld, as it would be on any decent one, or if Earth-11580 is one upon which ALL superheroes are composed of thousands of spiders writhing inside of a super-suit and collectively willing a singular identity into existence. Would he– would Spiders-Man be more or less unsettling and the stuff of nightmares if the reader could never actually see any of these reported spiders? It’s probably impossible to say. What can be confirmed is that that many pounds of spiders all trying to co-exist inside of the suit takes a toll, as the component parts can be seen crawling out of tears and holes at every point of the story. Oh, and of course, this colony of spiders clearly wants to eat humans – starting with the young Petey Parker of Earth-91918. Fans will have to hand it to Christos Gage and Dan Slott for this… memorable addition to the wide array of Spider-Man variants. On a broader scale, it raises some intense questions for fans to ponder. For starters, does one have to actually be Spider-Man to play the part? Or can anyone or, say, any colony of insects or arachnids believe they are Spider-Man hard enough to make it so? Does great power given to thousands of spiders in a spandex suit come with great responsibility? And most troubling… where did the spiders get the suit? Spider-Geddon #3 is available now from Marvel Comics.